Since the issue of Steve Wozniak's Prius arose yesterday, Toyota has been anxious to get in touch with the Apple co-founder to diagnose the problem and, according to his assistant, will take the car for testing. 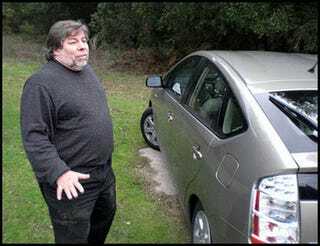 At a speech on Monday Wozniak claimed his new 2010 Toyota Prius, which isn't under the current Toyota recall, randomly accelerated while in cruise control mode and that he could duplicate the event. After reading a similar story on Gizmodo Wozniak commented that he was having difficulty reaching the manufacturer to tackle his issue. We called Toyota and they were clearly anxious to speak with Wozniak and so was he according to his assistant. "That's exactly what we were hoping would happen," she told Jalopnik. After passing on the contact info for a Toyota technical expert the company called us and asked us if we could actually send him Toyota U.S. President Jim Lentz's personal number. Wozniak is on the road and, as of this evening, hasn't spoken directly with Toyota, but his dealer is going to take the car for a week to test it and will give him a loaner in the meantime. We're anxious to hear how it turns out.